Search Results for: "cedar cycling"
These new Cedar Cycling standard short and long sleeve jerseys look amazing. I’m way into the color choices too. Stoked to see the women and men’s line taking off for this brand. Scoop up some Made in the USA goodness at Cedar Cycling today and check out more photos below. Cedar Cycling is having a huge sale on all their made in the USA merino cycling apparel. This includes all jerseys! For $105 you can have your pick with free shipping. Not bad at all, especially for the ladies who want to snag one of those killer women’s jerseys. First of all, I love the color and second, I love that Cedar is addressing a much-needed and requested niche: women’s cycling jerseys that are made in the USA. “Over a year in the making, The Women’s Standard is a best-in-class, made-in-America full-zip jersey. Spec’ed, patterned and prototyped by women, the Women’s Standard offers a tailored and smart-yet-comfortable fit built in our very own, very proven StandardWool. Finally, a psychologically, emotionally and physically superior jersey made right on every level. Save 10% and pre-order today. Pre-order one today at Cedar Cycling! Oakland’s own Cedar Cycling has a sale up on Huckberry right now. I’ve posted Huckberry sales multiple times here on the site and this sale in particular is worth the sign-up and click-through. The merino baselayers and PiNP jersey are discounted, so head on over to Huckberry to take advantage of the discount. This is looking damn nice. Made in the USA from only the highest quality merino wool. Designed by women, for women… Go go go Cedar! Sign up at Cedar Cycling for a 10% pre-order discount. Sometimes, deconstructing an everyday item like a cycling jersey is the best way to see the details. The guys at Cedar Cycling posted this infographic today for those of you wondering what their Standard Jersey looks like, from a detail perspective. In addition to their Midnight and Prolly is Not Probably Standard Jersey editions, Cedar still has a limited number of merino wool and merino wool blend tee shirts left in stock. We still have some stock in the PiNP x Cedar jerseys, too. So head to the PiNP Web Shop to scoop! Since most of my products usually sell out within minutes, I made sure Cedar Cycling made enough of our collaboration Merino Jersey. We still have stock and after a lot of demand, are taking wholesale orders for shops. Contact Neil at Cedar Cycling directly for wholesale or pick up one of these rad jerseys in the PiNP Web Shop. Everyone has been incredibly supportive and most importantly, very impressed with these! Last year, at NAHBS, I met Jeremy and Neil from Cedar Cycling, a new cycling wear brand. Using high-end Australian merino wool blend fabric and local manufacturing in California, I knew Cedar was really doing something genuine and legit. Over a bottle of bourbon, we discussed working on a jersey. But since they had barely just launched their brand, we knew it would be some time before we’d have samples. Earlier in the summer, I met up with them in SF to look at fabrics and discuss the jersey in detail. Then, a few weeks ago, I finally got my hands on one. I was really, really impressed. This is one of the nicest jerseys I’ve ever owned. We worked really hard getting everything right, especially the fit. It’s form-fitting, without being race cut. The sleeves sit just right and the front lies flat on your chest. One of my biggest qualms with a lot of jerseys that I own is the pocket room. Especially during the winter. You end up stuffing arm warmers, a gillet and gloves into your pockets on the daily. Three generous open rear pockets hold all your ride essentials, plus two hidden zippered pockets to keep your valuables safe. The whole jersey is held in place by silicone gripper imported from Italy. The fit is true to size. I wear a large shirt and a large jersey. Pre-order one at the PiNP Web Shop today! These will be shipped on January 18th. 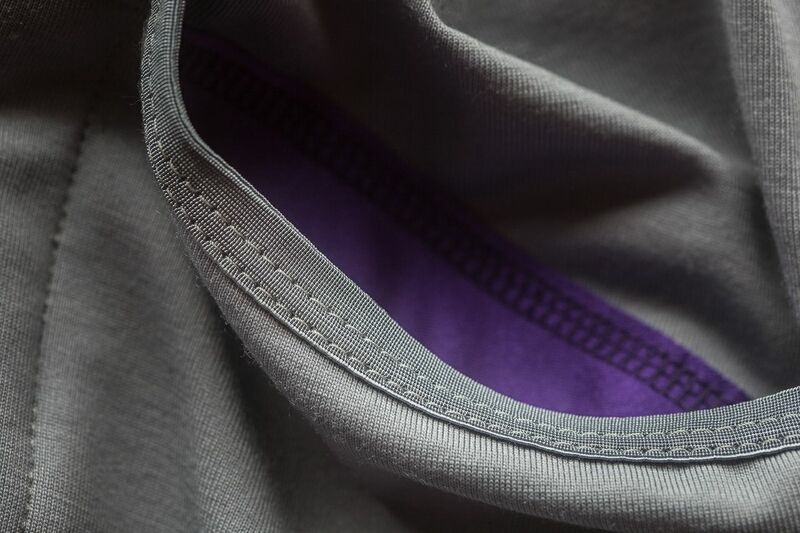 *One small note, our factory sewed up all of the jerseys with the rear pocket purple trim except for the mediums. Medium jerseys will have a grey pocket trim, matching the jersey. See this picture. Everything else is the same. Sorry! I just got word that the Cedar Cycling x PiNP jerseys are going to be ready to pick up next week. We’re still doing a 10% pre-order discount, however, to give people a chance to get a great deal on this amazing jerseys.